Handbrake and MacTheRipper are so far the best Mac DVD rippers that are thoroughly free to everyone. If you get caught up in dealing with the chaotic DVDs and want to make them movable especially on the road, these two pieces of Mac DVD ripper software are definitely the best companions that allow you to freely decrypt and rip DVD movie on Mac with ease, whereupon you can enjoy movie on the go without stuffing the cumbersome DVDs into your knapsack. In view that many people are still unclear about these two apps, here we will list the nitty gritty about Handbrake vs MacTheRipper review, with both pros and cons. Tips: if you are prone to have more DVD ripping on your Mac OS X for playback on iPhone, iPad, Android, etc, please try this Mac DVD ripper to fulfill your needs. Free download the best DVD ripper better than Handbrake and MacTheRipper to rip copy protected DVDs to AVI, MP4, MOV, WMV, etc on Mac and Win. MacTheRipper is a free DVD ripper (extractor) working under Mac OS X. It has received wide recognition for its powerful abilities to do away with all the copy protections and region controls encoded by DVD publishers. 1. Mac The Ripper is good at disabling CSS encryption and Macrovision protection, removing region code by setting the disc's region to '0' for region-free and get rid of RCE region checking. Better still, it allows you to copy DVD on Mac in VIDEO_TS folder, regardless of ARccOS copy protection. 2. This free DVD ripper for Mac comes with a very clear manual and an intuitive interface, which can be more acceptable by those non-professionals as MacTheRipper makes it a snap to backup DVD to your Mac's hard drive. 3. MacTheRipper endeavors to rip the main feature of a 100-minDVD movie in 22 minutes and 52 seconds, which is really a shorter period of time compared with other similar DVD ripper for Mac. Tips: For those who want to know how to use Mac The Ripper to extract or rip DVD on Mac OS, please head over to MacTheRipper tutorial. 1. MTR 2.6.6, though easy and free to obtain, does not work on any version of OS X past Snow Leopard. So if you've upgraded your Mac OS to Lion, Mountain Lion or even Mavericks, seeking for a MacTheRipper alternative to do your DVD ripping is of top priority. 2. Seeking for the latest version of MTR is not suggested in consideration of its information obfuscation and back-alley character, which will only frustrate, confuse, and anger you. 3. Mac The Ripper only helps to copy DVD to hard drive in VIDEO_TS folder, which is not supported by many other portable devices. So if you want to make your DVD watchable on your iPhone, iPad, Android, Mac The Ripper is not the way to go. The open-source Handbrake has dominated the DVD ripper market whether you are using Mac, Linux or Windows. This free DVD ripper allows Mac users to liberate movie content from the stiff disc and make it viewable on iPhone iPad without striking a blow. 1. 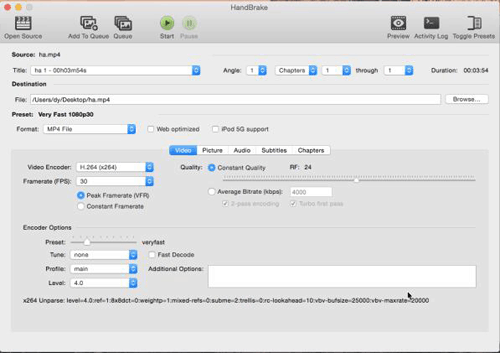 Handbrake provides handy presets for Apple devices, etc, making it pretty easier. So if you want to rip DVD for playing on iPhone, iPad, iPod, Apple TV, this free DVD ripper for Mac can be your first choice. 2. Compared with Mac The Ripper, Handbrake rips DVD to MP4 and MKV formats while MacTheRipper only helps to save DVD in VIDEO_TS folder. 3. It is no exaggeration to say that Handbrake sets the standard for easy DVD ripping. It is able to rip DVD to iPhone iPod in a speed and quality that are both surprising. You can learn how to use Handbrake to rip DVD on Mac. 1. When it comes to your new DVD movies protected by CSS , Sony ARccOS, Region protection, UOP, APS, etc, Handbrake Mac will not live up to your hope. As a result, you have to handle it with the assistant of VLC to decrypt DVD before ripping it. 2. The open-source free Mac DVD ripper does not keep abreast with the latest Mac OS X macOS Sierra. So for those tech geeks, it's advisable to go in for a DVD ripper for Mac that is constantly refreshed to support the newest changes, be it your Mac OS or your mobile devices. 3. Handbrake has a lot to do in terms of output format. This Mac DVD ripper freeware only achieves to encode DVD to MKV and MP4 format. The need to rip DVD to M4V, MOV, FLV, AVI, etc or put DVD on Samsung, HTC or other tablets or phones seems to be never realized with Handbrake. Both Mactheripper and Handbrake realize your different needs of ripping DVD. But if you want a Mac DVD ripper to fulfill your DVD converting needs for playback on more mobile devices, you can turn to MacX DVD Ripper Pro. This DVD ripper for Mac helps to copy and rip any protected DVD to MP4, FLV, AVI, MOV, WMV, etc and offers profiles for the latest crop of Apple, Android and Google devices, so that you can play any DVD movie on iPhone XS/XR/X/8/7/7 Plus/6S/6, iPad Mini, HTC One, Samsung Galaxy S9, Google New Nexus 7, Kindle Fire HD, WP8, PSP, Xbox One, etc with high quality. For fluently playback the converted DVD contents on the mobile devices, you are suggested to use MacX MediaTrans to transfer videos from computer to iPhone iPad iPod. This ultimate iOS data transfer also supports export music from iPhone to Mac, copy photos from iPhone to computer, download eBooks from iDevices to computer and more. Download 2018 best free DVD ripper to rip DVDs to MP4, MOV, AVI, MKV, MPEG-2, ISO image, etc. on Windows 10/macOS Sierra. The top DVD ripper can even copy protected DVDs like Disney, Sony DVD without encryption tech limits. This is the tutorial about RipIt for Mac guide to rip DVD on OS X. Besides, a RipIt for Mac alternative is shared when RipIt won't work with commercial DVDs.